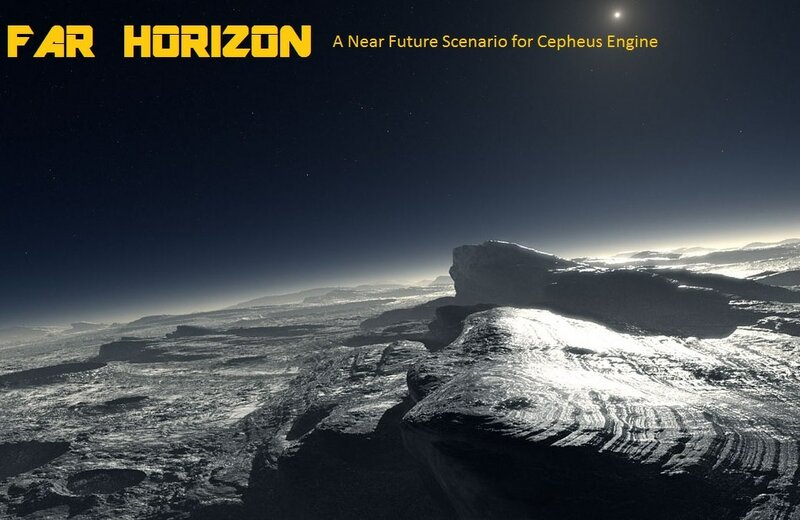 Far Horizon is a Near Future science fiction adventure and spaceship book for Cepheus Engine and for the Classic 2D6 SF roleplaying game that is based on. It is 2100 AD and the Earth’s Space Development Agency has funded a mission to the outer edge of the Solar System. Pluto and Charon have been explored and human landings have been made for the first time. Now the crew has taken on a new mission to explore Tartarus, a minor planet billions of kilometres from the Sun and one that is a rogue and not native to our Solar System. Tartarus is a passing interstellar traveller and Earth wants the crew of the Far Horizons to be the first humans ever to land on such a mysterious ‘rogue world’. Its irregular trajectory has the scientists on Earth puzzled – and there’s nothing like getting humans on to the surface to solve a puzzle! The exploratory spacecraft, the DRV Far Horizon, is described in detail and illustrated with comprehensive deckplans. Tartarus, its dangers and its secrets, are fully explained. Events and situations to challenge the player characters are presented for the referee. The format of the scenario is based around a realistic mission of scientific exploration. Rules for operating this TL 9 spacecraft and its landers. Rules for the design and use of TL 9 spacesuits. For referees without a copy of Orbital 2100, twelve pregenerated characters are provided, each one a competent and skilled astronaut. This title is designed to go with the Zozer’s Alternate Traveller Universe (ATU) setting of Orbital: 2100 although everything is included here to play this adventure with just the basic Cepheus Engine rules if needed. Inside one finds not only background into the mission but also a complete description of the DRV Far Horizon, a nuclear-thermal rocket for exploring deep space. Included also are rules for TL9 Vacc Suits. The adventure itself is a race-against-time investigation into the unknown.